Tingwall, (Old Norse: Þingvǫllr = Field of the Thing assembly) is a parish in Shetland, Scotland. Located mostly on the Shetland Mainland, the centre lies about 2 miles north of Scalloway. Tingwall Airport is here. The Mainland section is divided into two districts by a hill ridge, and comprises two parallel valleys (nearly at right angles from the ridge). 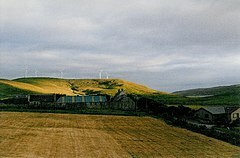 The Tingwall valley extends north from near Scalloway to the south end of Lax Firth. It is diversified by the lochs of Tingwall, Girlsta, Asta, Strom and some others. It is so indented by the sea as to contain no point farther than two miles from it. Measured across marine intersections, it has a length of about nineteen miles, and a maximum breadth of ten miles. The small promontory at the end of Tingwall Loch, known as Tingaholm or Law Ting Holm was once home to Shetland's earliest parliament. It was once an islet entirely surrounded by water and accessed by a stone causeway. In the 1850s the level of the loch was lowered, and the holm took on its present form. Tingwall was also the base of the Archdeaconry in Shetland. The present day church lies on the site of a much older building, originally dedicated to St Magnus. The burial vault in the churchyard is believed to belong to this earlier building, which is thought to have had a round tower, similar to that of the St Magnus Kirk on Egilsay, Orkney. There are a number of ancient and historical monuments in Tingwall, including a standing stone  known as the murder stone. This stone is traditionally said to be the site where the Earl of Orkney killed his cousin in a power struggle over Shetland. Local folklore also suggests that a person could escape punishment at the Thing if they were able to run to the stone and claim sanctuary. Other versions of this story involve running to the Kirk, or the nearby croft at Griesta. Tingwall was the home of brothers Laurence I. Graham (Lollie) and John J. Graham, two of Shetland's most influential 20th Century Writers. Tufted duck, red-breasted merganser and common and black-headed gull frequent the loch, which is also home to Shetland's only mute swans. ^ Turnbull, Rev John (1845). The New Statistical Account of Scotland: Sutherland, Caithness, Orkney, Shetland, General index. The New Statistical Account of Scotland. 15. W. Blackwood and Sons. p. 59. ^ "Tingwall Central Mainland Law Ting Holm Shetland Parliament". iknow-scotland.co.uk Retrieved 15 August 2010. The original article is based on Shetlopedia.co a GFDL wiki. Wikimedia Commons has media related to Tingwall, Shetland Islands.